One of the most thrilling things about planning an unforgettable Iceland wedding is planning the adventurous honeymoon! Are you a couple who likes to self-drive sight-see, embark on unique tours, or spend your days hiking to somewhere EPIC? If the latter, oh la la this Iceland Wedding Planner post today is for you! 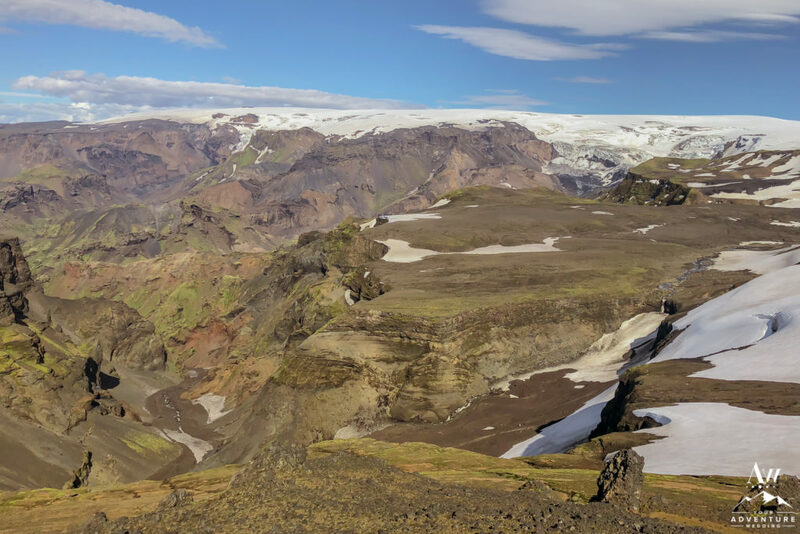 Today we would like to introduce you to the 5 Most Breathtaking and Picturesque Hikes to have during your Iceland Honeymoon!! 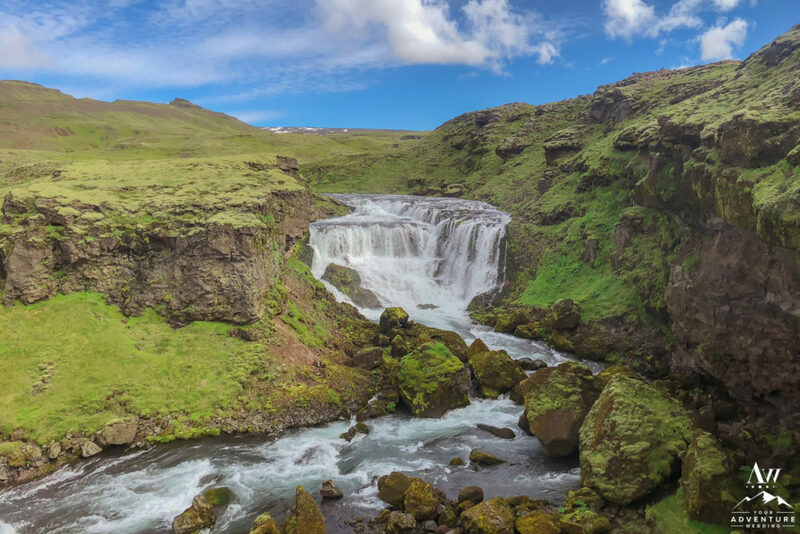 Connecting with nature should be high on your priority list if you have chosen Iceland as your adventurous honeymoon location. A fantastic way to do this is to do a full day hike. One of the most jaw-dropping trails (in my personal opinion the most) is the famed Fimmvorduhals Hike. Never have I ever seen so many magnificent waterfalls on one hike! It’s really freaking magical!! Note: It is best to do this hike from July to mid September (depending on weather conditions). So where to start this post Iceland wedding hike? 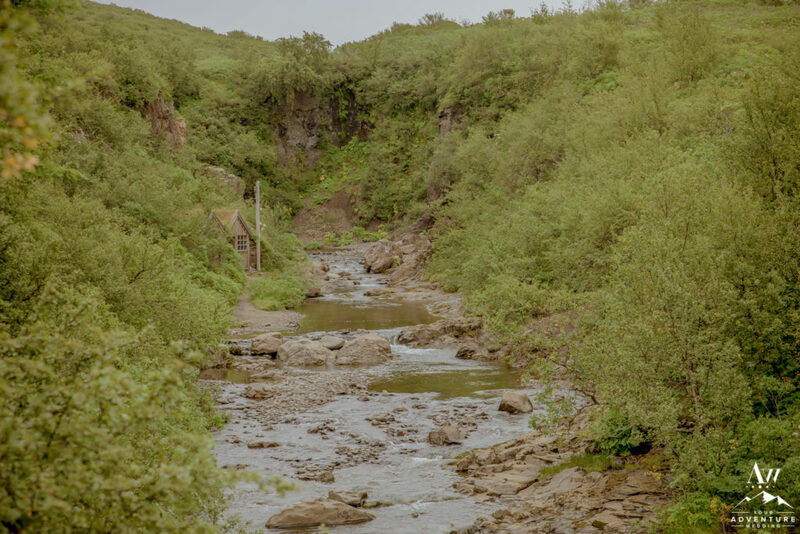 When my husband and I have done the hike, we find parking my super jeep in Thorsmork (at Basar Campground) and camping there at the end of the hike is the best. The night before, we spend a night there setting up camp and we take his truck then to Skogar to begin the hike in the early morning the following day. 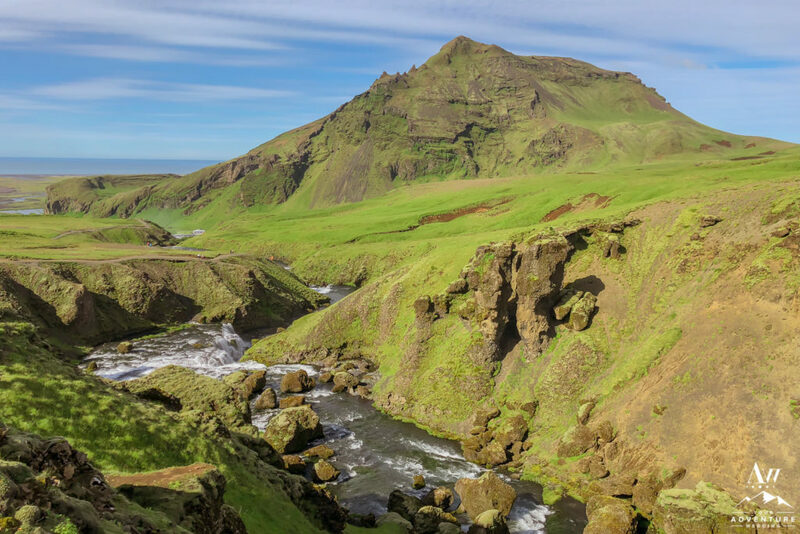 The alternative is (if you are not renting a 4×4 truck capable of doing F-Road river crossings and able to go into Thorsmork, is to park your car at Skogafoss and then take the highland bus out of Thorsmork (2018 bus schedule HERE). 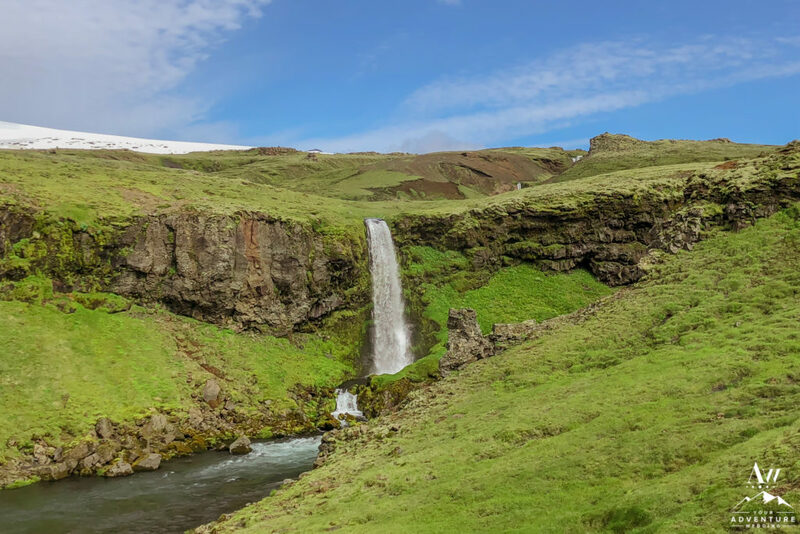 Upon arriving to Skogafoss Waterfall, take the stairs to the top and begin your trek on the well marked trail. 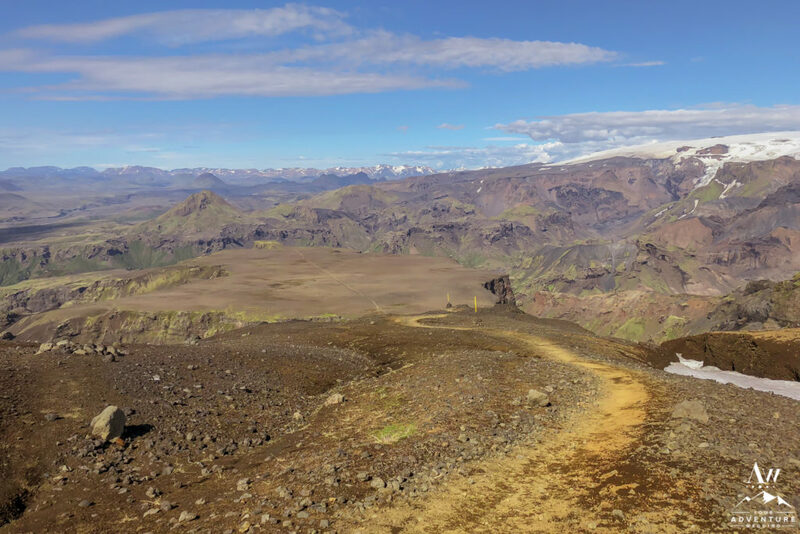 It’s an intense hike folks, you will easily dedicate between 8-12 hours of your day to this hike so make sure you do your research and pack appropriately before heading out on the trail after your Iceland wedding day. If you’re not a hiker you may not enjoy it, so maybe check out one of the less intensity hikes below as a trade off (or only do a portion of the hike). All of the waterfalls are in the first half (3-5 hours) of the hike (one way). 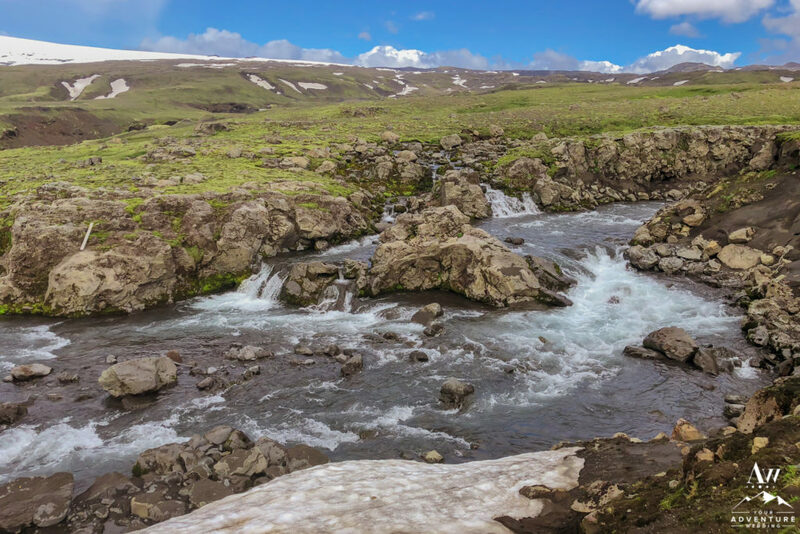 So come along with us so we can share with you a highlight reel of some of our favorite points during the Iceland honeymoon hike, Fimmvorduhals! There is no shortage of waterfalls on the Fimmvorduhals hike, that’s for sure! I think I stopped counting after I went past the 15th one! There were some I didn’t even photograph because they were just “okay” compared to all of the other stunners and plus it’s fun to just enjoy some too along the way. One of our personal favorites is the next one below and also the one we stopped at to have lunch (it’s the last waterfall as the landscape then changes to more highland desolation. 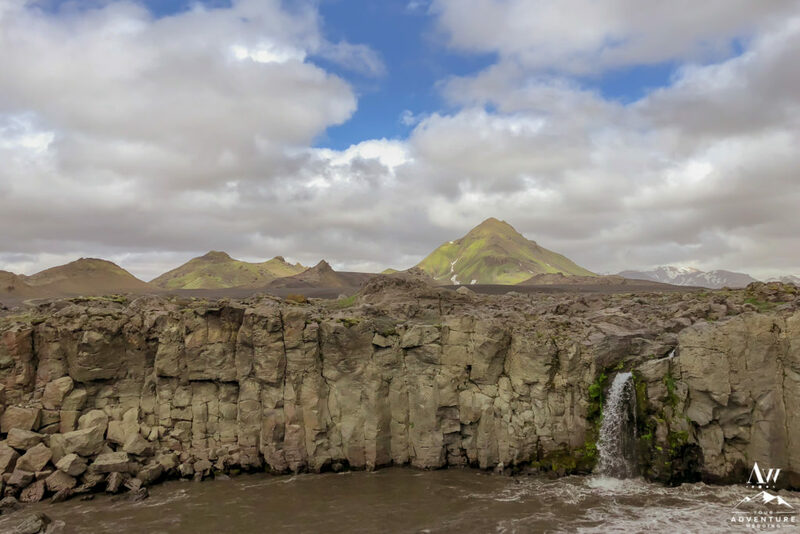 If you’ve been dreaming of an adventurous hiking elopement in Iceland, heading out on the Fimmvorduhals hike to get married may be the perfect experience for you! Shortly after the above waterfall (45-60 minutes) you have the opportunity to split this hike up into 2 days versus 1 very long day of hiking. You may rent a bed at either of the 2 huts Baldvinsskáli (newer / closer) and Fimmvorduhals Hut in advance (or at the time you arrive depending on availability). 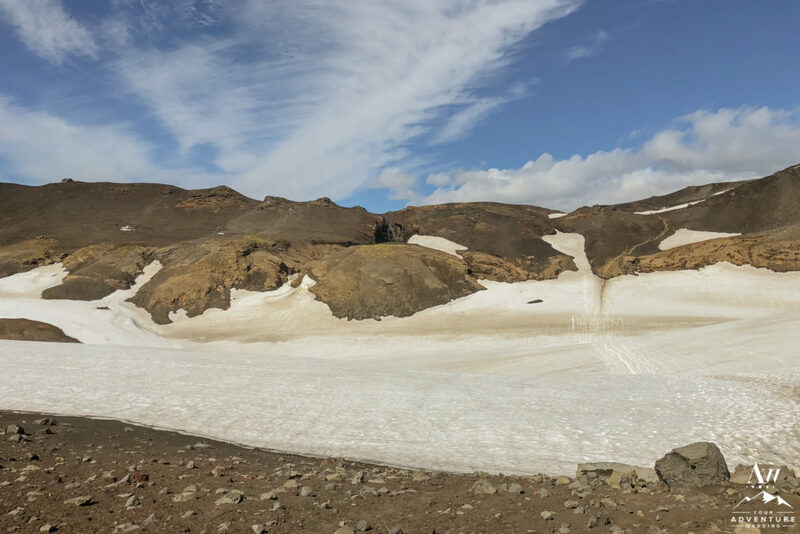 If you choose to continue on then you will begin one of the more dangerous sections of the hike, as you hike between the glaciers (Eyjafjallajökull and Mýrdalsjökull) where you will hike through snow / ice. 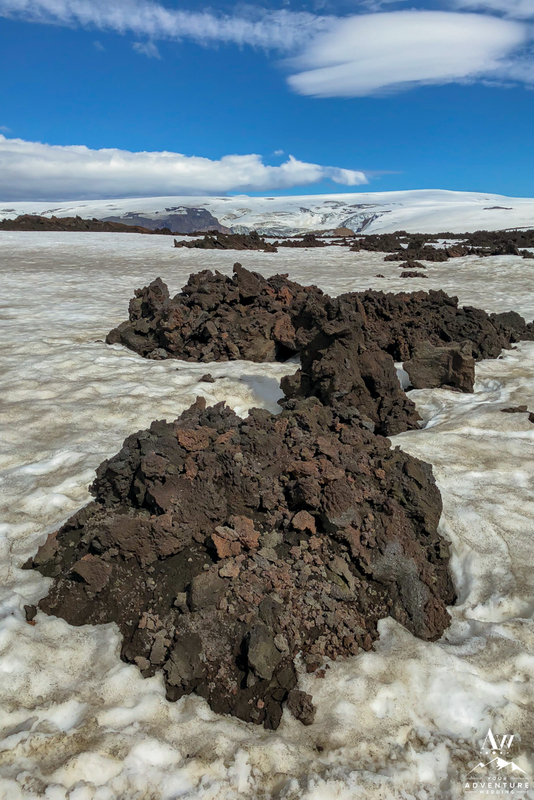 As you push through the last bits of snow, you will encounter the volcano Eyjafjallajökull which formed Magni and Móði (8 year old mountains formed from that eruption and the lava below). Unique site and by this point it will all be downhill for the hike as you head into the Thorsmork Valley towards the end of your Iceland honeymoon hike. 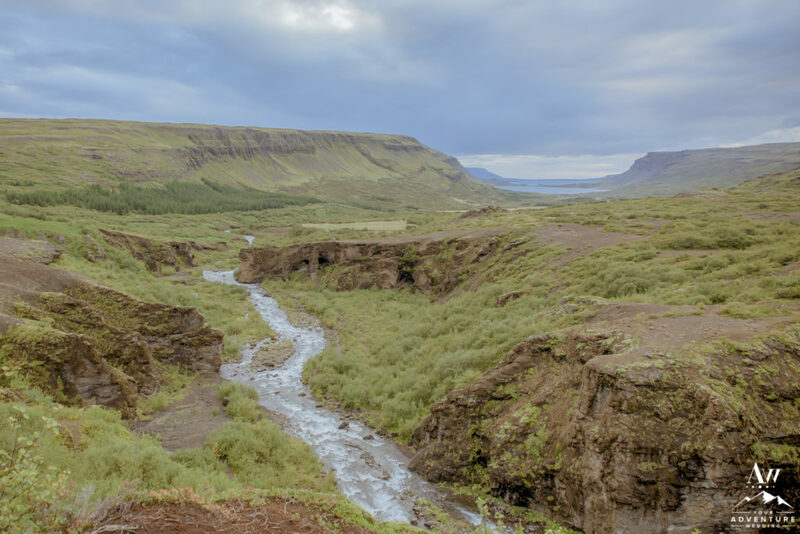 As you head down into the Thorsmork Valley towards the Basar Campground, you will encounter some crazy beautiful views! Savor them! Just because you may be a bit fatigued at this point should not stop you from being in the moment here. 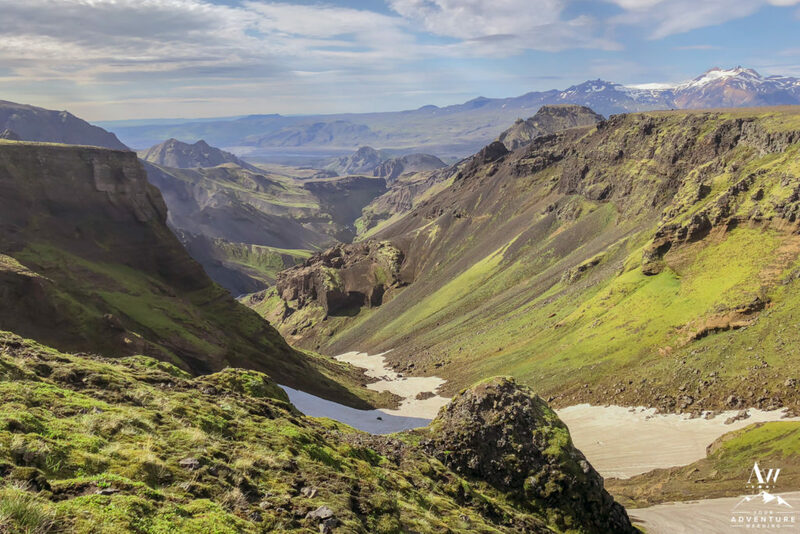 Enjoy it, after all it is your Iceland honeymoon and you’re on one of the prettiest hikes in the WORLD! Laid your eyes on 26 waterfalls, 2 volcanoes, 2 glaciers! 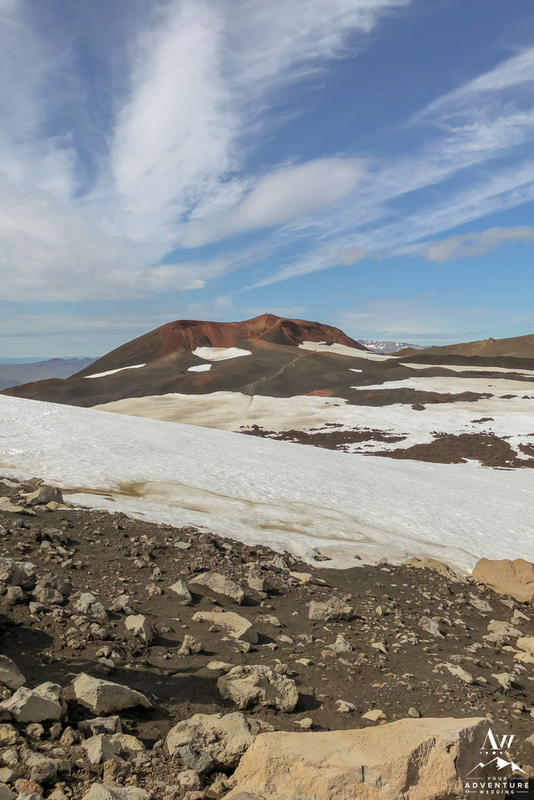 Hiking to the top of Iceland’s tallest hikable (that’s a word, right?) 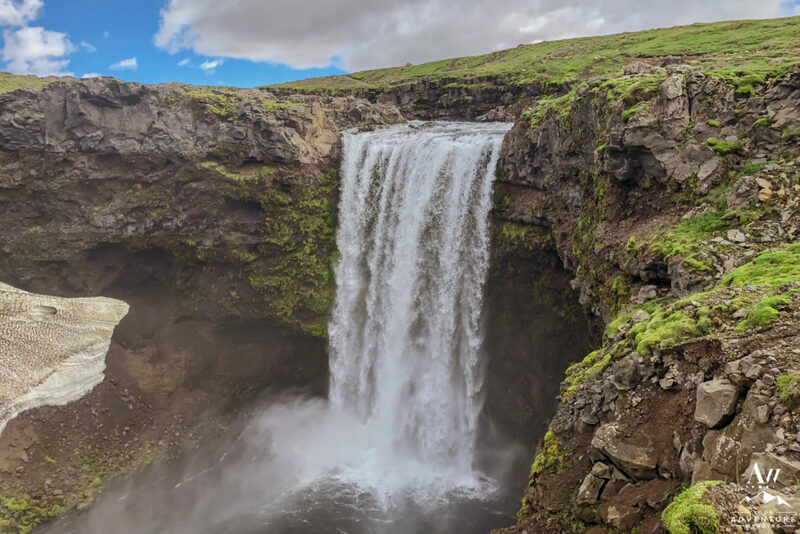 waterfall should be on any Iceland honeymoon bucket list! 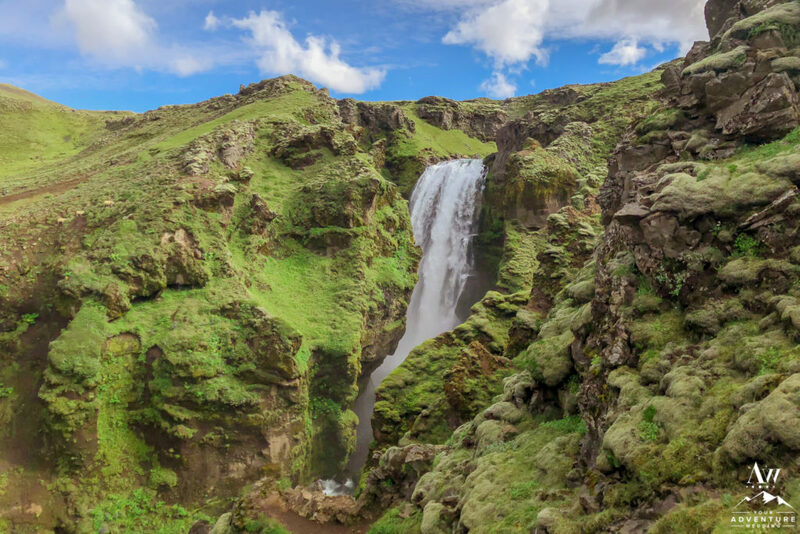 Glymur Waterfall sits pretty at just under 1,000 feet high. Hiking this waterfall is around 3 hours round trip (just under 5 miles) without stopping. The intensity is lower but there are some spots that are a tiny bit challenging like crossing the river (hold tight to the cable as you cross). We only suggest doing this hike between May-October. 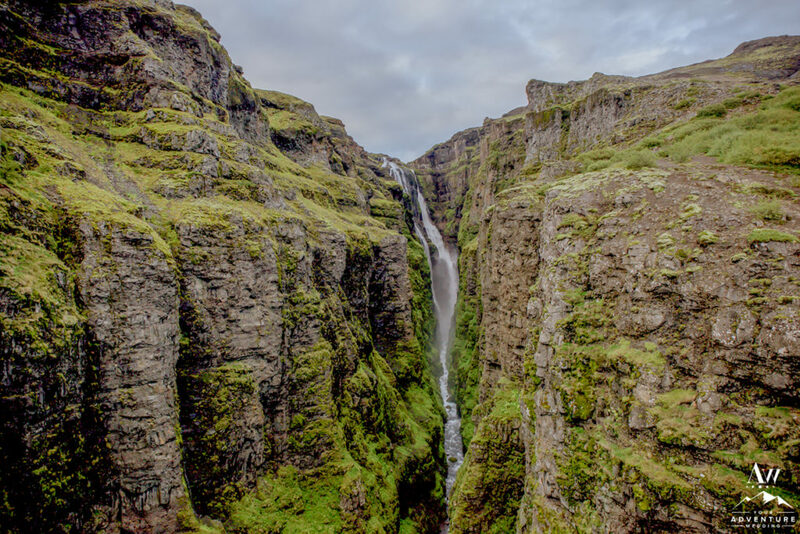 More info on doing the hike to Glymur Waterfall from the fabulous folks at Best Hiking. Looking for a nice place to stay nearby? 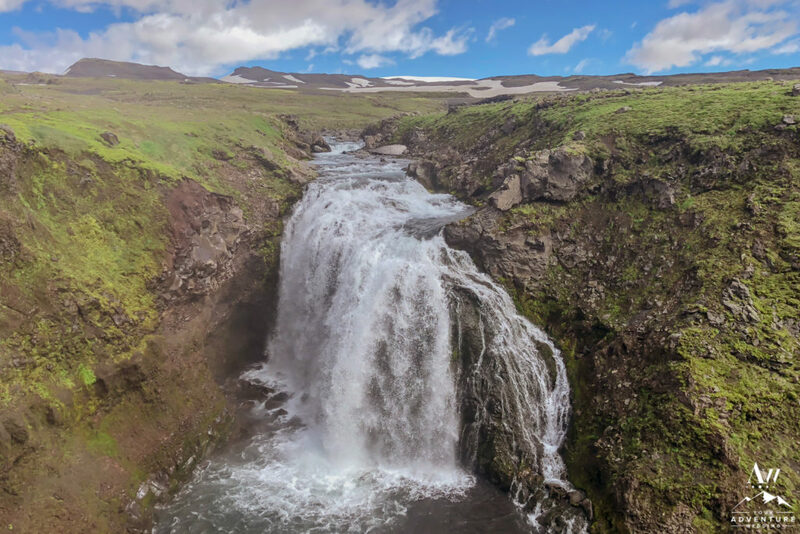 Hotel Glymur is a perfect to place to base yourself at during your Iceland honeymoon adventures if wanting to adventure on this hike, as they have apartment style hotel rooms and romantic villas! 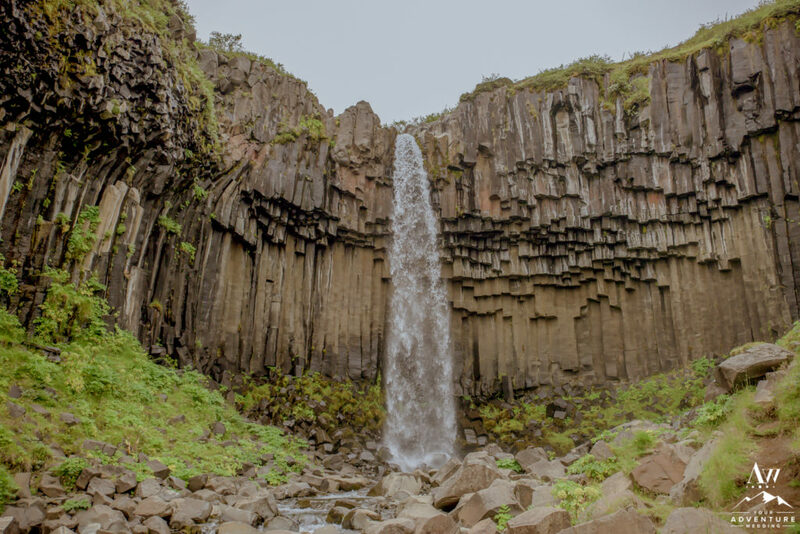 Inside the Vatnajökull National Park, you will find a fantastically fun hike to a waterfall which emerges from basalt rocks in Skaftafell called Svartifoss. It’s a relatively easy hike even for folks who are not super fit (just take it slow in the challenging parts). It’s about a 60 feet tall waterfall and just under 3.5 mile hike round trip. It’s a hike that can be done year round but be-careful when snow and extreme rain/mud. 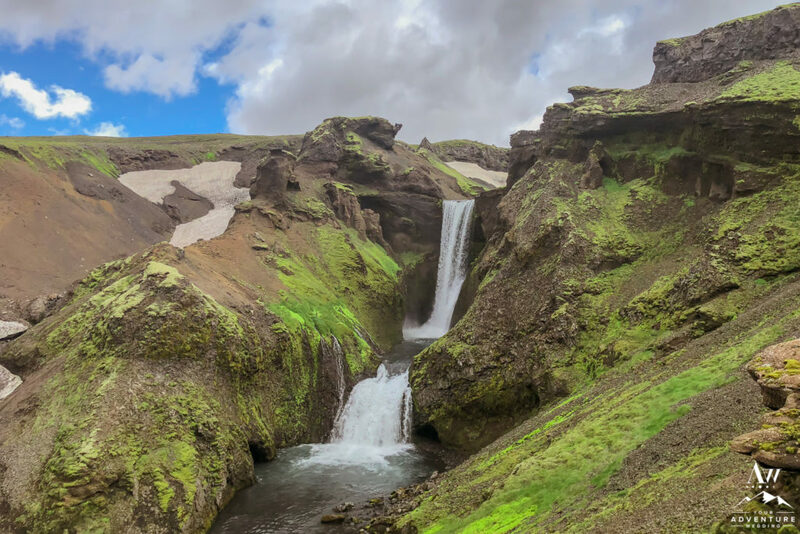 If you ask us, this is a perfect day hike to adventure one together during your honeymoon in Iceland! Along the way you’ll also encounter some other waterfalls like we did during this Iceland honeymoon photo session, HERE. The area around the waterfall now has fences to protect the landscape from the overwhelming amount of tourists. So you cannot go as close as you once could before, but it’s still nice! 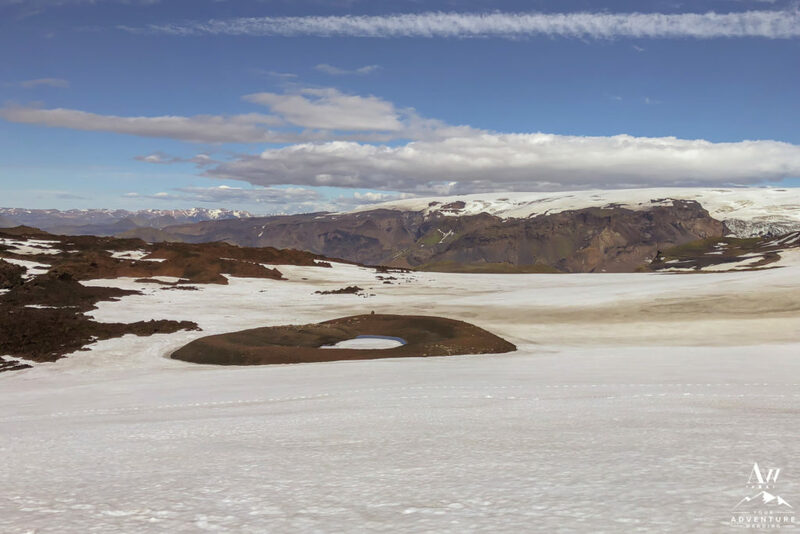 Note: Beware if you think this would be a nice spot for your Iceland elopement (you also need permission from the park commission). Be respectful of nature so others after you may enjoy too! 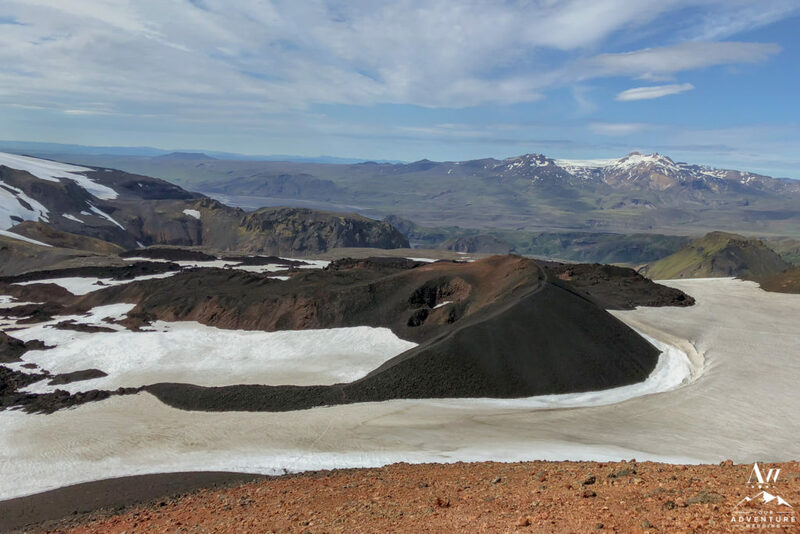 If you are an adventurous couple who is up for more of an intense challenge, we would suggest you embark on the famed 4 day hike called Laugavegur (hiking from Landmannalaugar to Thorsmork which is where we ended the Fimmvorduhals Hike if you recall). This is several day hike is intense and need preparation and advance planning with the correct gear. Please see more in-depth details HERE. If you are not quite that adventurous, don’t worry there is a super awesome alternative! The Landmannalaugar area itself is super cool to explore. Interesting textures, multi-colored tones, and cool self drives (if you have a 4×4 that is F-Road and river worthy or take the highland bus in). There you will see the mountains be blue, red, yellow purple, black and a very vivid green (if coming during summer). Short hikes that vary from 1-4 hours are also around the area and there is a natural hot spring pool you can also delight in near to the campground to soak in after your day hikes. This area is open for exploration from mid June to mid October (even outside of these months with the right kind of transport and time). 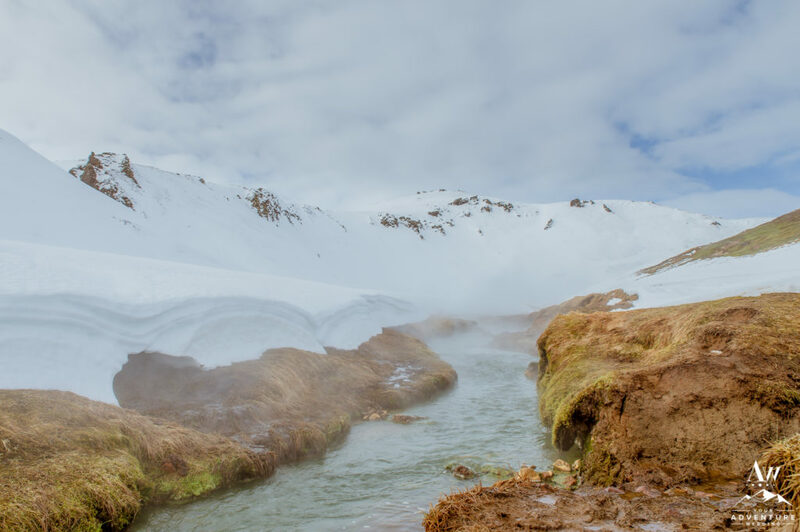 If you crave colors and are intrigued by Iceland’s geothermal activity then embarking on the Hengill Volcano hike may satisfy both of those curiosities! 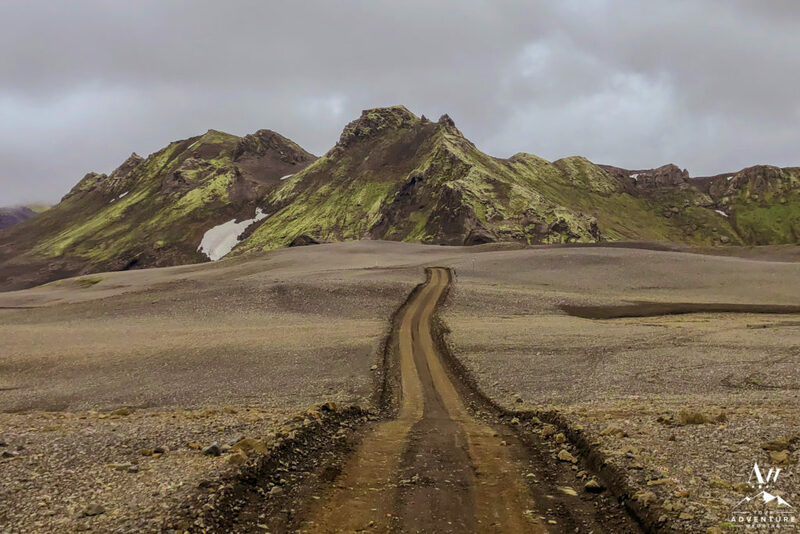 Outside of the winter months there is a super cool road called, Nesjavellir. 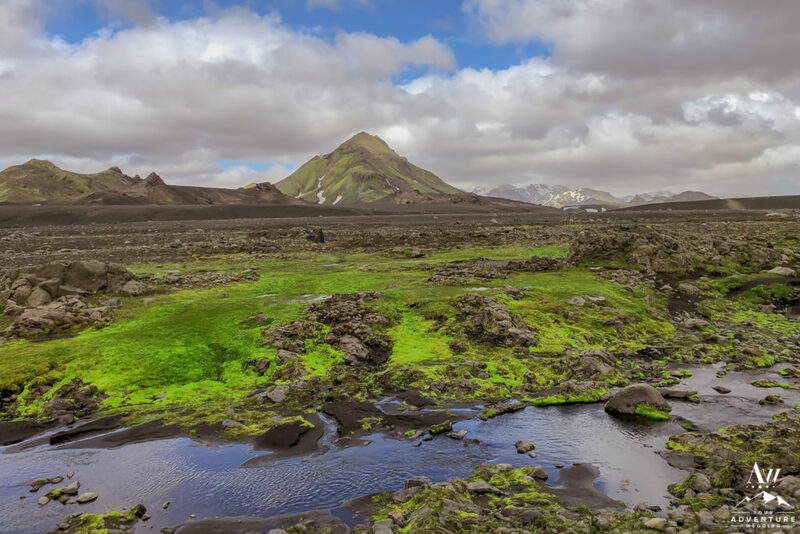 It is there you will begin the Hengill Volcano hike with the choice of doing a loop or ending at a hot spring river area called Reykjadalur (translation: Smokey Valley). You can research and decide on your specific route when you look at the route options HERE. 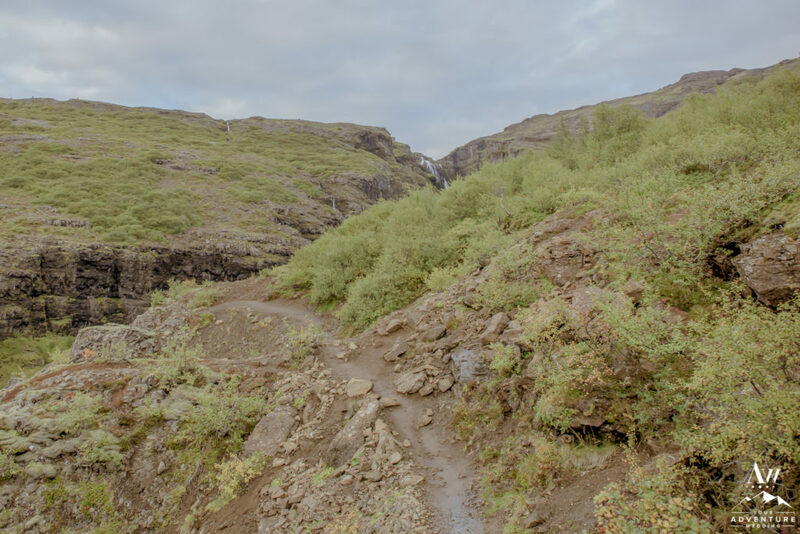 If there is bad weather (check Belgingur) on the hiking route you want to set out on you should postpone because of the areas you will hike through can unforgiving. Make sure you also make a plan on SafeTravel.is before you head out so that people know where you went and were expected back.